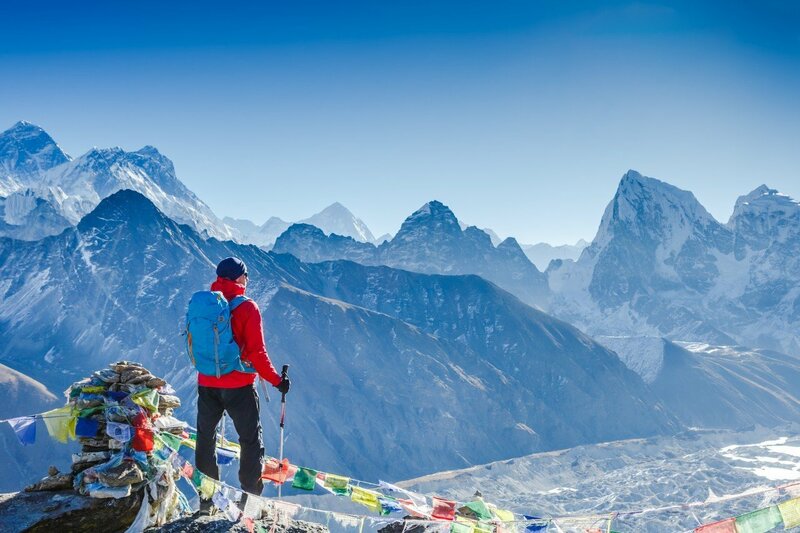 While only the very few ever get to scale the mighty 8,848m peak of Everest, the next best thing for the seasoned adventurer is the classic route to Everest Base Camp. A tough but rewarding challenging, this trek reaches the dizzying heights of 5,545 metres, so even with the solid assistance of some ever-reliable Sherpa guides, you need to be extra fit, an experienced hiker, and with all the right gear, clothing and footwear. Most tackle the route from the Nepalese side of Everest, known as the South Base Camp. But if you want to tackle the North Base Camp in China you’ll need a Tibet Entry Permit and Aliens’ Travel Permit from the Chinese government. Accommodation is in local family-run teahouses which are simple but comfortable lodges with basic facilities. The classic Everest South Base Camp trek spans around 14 days of travel to the base and back again. The trek is not as remote as you might imagine as the trail is dotted with teahouses, tiny villages and monasteries as well as other trekkers sharing this popular expedition. It usually begins with a scenic flight from Kathmandu and a thrilling landing on the remote mountain airstrip of Lukla. The route begins gently, following the Kosi River, passing through Himalayan villages and well tended fields before a long steep climb to Namche Bazaar, a colourful market town clinging to the side of a hill, to spend a couple of days exploring the locality while acclimatising to the 3,440m altitude. From Namche Bazaar, the route ascends through rhododendron forests to Tengboche and then on to Dingboche, the highest permanent Sherpa village in the region for another day of acclimatisation. From there, the route passes through the Pheriche Valley and along the Khumbu glacier with its superb views of the nearby Himalayan peaks to reach Lobuche. Finally the routes crosses the Changri Glacier to Gorakshep to arrive at Everest Base Camp. Everest Base Camp is best visited from April to June, and September to December, the dry season in Tibet when Everest is more likely to be viewed in clear weather. High season for tourism is July to August but this is also the rainy season so the mountain can be shrouded in cloud and mist.